The well organised Football Festival by Cook Islands Football Association through its thrilling Just Play Program had exciting activities for all the children to experience on the last week of the school holidays. Just Play Manager Michelle Paiti said “Numbers were lower than expected but all the children who joined the morning program were certainly active and enjoyed the fun activities put on by all the volunteers“. Ten year old Jake Browne and nine year old Jordan Peraua attend every Football Festival they can. “I love the football festival and would encourage all the kids to just come and play football. Just enjoy yourself and have fun with sports” said Jordan Peraua. “For me the Holiday Football Festival is lots of fun where I can make new friends, play with my cousins, play games outside and just be a kid” said Jake Browne. “Even during the cooler months we get outdoors, be active and have fun” continues Just Play Manager Michelle Paiti. Paiti would like to thank all the coaches and volunteers for their time and huge efforts on Thursday. 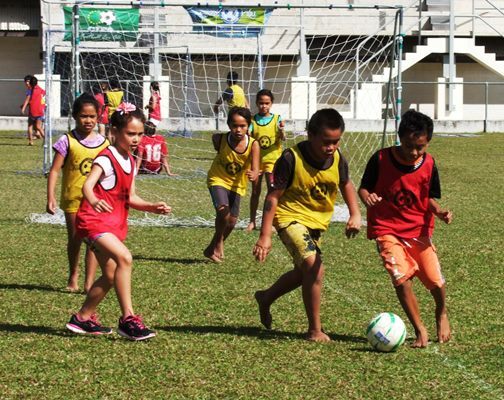 Cook Islands Football would like to acknowledge the continued support and funding through the Just Play Social Development Programme from the Australian Government (AusAid), Oceania Football Confederation (OFC), UEFA and UNICEF.